Japan decided Tuesday to pursue the deployment of aircraft carriers for the first time since the end of World War II and beef up its defense in new domains of warfare, such as cyberspace, under its new 10-year defense policy. The latest national defense guidelines, which will enable Japan to modify helicopter carriers so they can launch U.S.-made F-35B fighter jets, were adopted as the government sees the security environment increasing in uncertainty amid China's expanding military activities and rapid advances in technology. "We need to develop truly effective defense abilities, rather than simply expanding traditional ones," the government says in the policy, which covers a period from fiscal 2019 and is endorsed by Prime Minister Shinzo Abe's Cabinet. The policy was last updated in 2013. Swiftly reacting to the new guidelines, Chinese Foreign Ministry spokeswoman Hua Chunying expressed the country's "strong disappointment and objection" over the documents and urged Japan to "act cautiously" in the military security field. China was among the highlights in Japan's new defense guidelines, with the Japanese government saying China's military activities in the East China Sea and other surrounding waters are a source of "strong concern" in the region. It also warns of China's quest for military supremacy in space and the cyber domain that could enable the country to disrupt command and control systems. 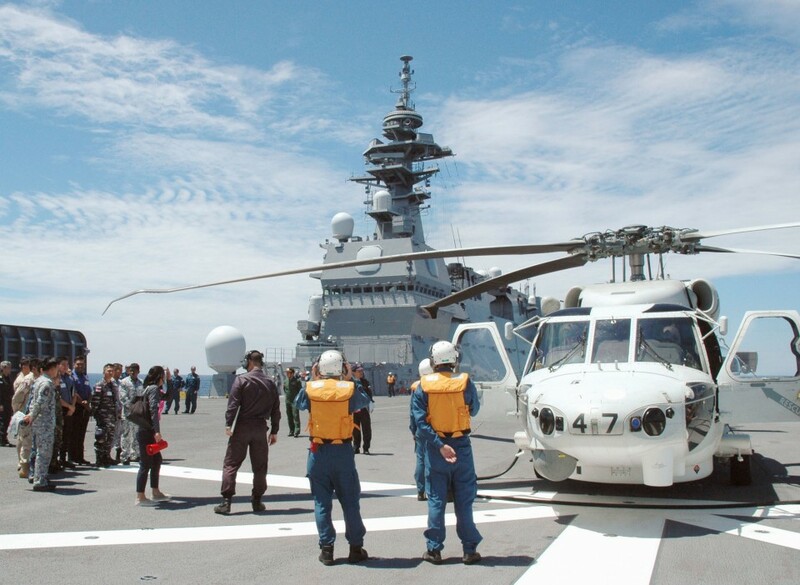 As part of efforts to enhance the defense of islands in the Pacific Ocean and other areas where not many airfields exist, the Japanese government says it plans to upgrade Izumo-class flat-top helicopter carriers to enable it to transport and launch fighter jets, such as F-35Bs. "We will refit Maritime Self-Defense Force multipurpose helicopter destroyers so fighter jets capable of short takeoffs and vertical landings can be deployed when necessary," the government says in its new five-year midterm defense buildup program, which was endorsed along with the defense guidelines the same day. The idea, however, has already been criticized by some defense experts who call it a deviation from Japan's self-defense-only posture, which has been maintained under the postwar pacifist Constitution. Apparently to reassure the public, the government stipulates in the defense buildup program that it has no intention of possessing an offensive type of aircraft carrier deemed to exceed the constitutional limit. Defense Minister Takeshi Iwaya told a press conference that the ships will not constantly carry fighters and will continue to be used for transportation and other purposes even after modification, suggesting their operations will be defensive in nature and will not violate the Constitution. He also admitted that U.S. fighter jets may land on and take off from the ships during emergency situations, Japan-U.S. joint military exercises and in cases when Japan is under attack. In the guidelines, the government also places considerable emphasis on the need to deal with the fields of cyberspace, outer space and electronic warfare. It describes the areas as having the potential to "fundamentally change the shape of national security" that has so far mainly focused on conventional ground, sea and air domains. Noting the increasing need for Japan's ground, maritime and air units to act flexibly across all kinds of domains, the government says it will aim to form a "multidimensional joint defense force." The Self-Defense Forces are also expected to drastically improve their cyber defense abilities, such as by possessing the ability to obstruct the enemy's use of cyberspace when Japan is under attack, it says. But it may require careful consideration for Japan to carry out such "counterattacks" as the country restricts the use of force for self-defense to certain conditions in light of the Constitution. Further complicating the issue is that there is no established definition of cyberattacks internationally and that it is also believed to be difficult to identify the attacking source at an early stage. Turning to outer space, where Japan is seen to be lagging behind other countries in the race to gain military superiority, a new unit will be created inside the Air Self-Defense Force to continuously monitor the space situation and to act for the nation's defense. The government also plans to invest in artificial intelligence technologies and underwater drones. To achieve the latest Medium Term Defense Program that covers a five-year period from fiscal 2019, the government says it expects to spend around a record-high 27.47 trillion yen ($243 billion). The program includes a plan to buy a total of 18 F-35B short takeoff aircraft apparently to put them on Izumo-class carriers, as well as to install two U.S.-developed land-based Aegis missile systems to counter the North Korean nuclear and missile threat. The government also decided Tuesday to purchase an additional 24 F-35Bs and 63 F-35A aircraft, which have conventional takeoff and landing capability. The decision will eventually enable Japan to build a fleet of 147 F-35s, including 42 F-35As already on track for deployment. With Japan purchasing U.S. defense equipment mainly through the foreign military sales arrangement, the government says in the latest defense guidelines it will seek to "streamline" the process to procure the sophisticated armaments "efficiently." Japan has been under pressure from U.S. President Donald Trump's "Buy American" policy. The foreign military sales arrangement is used by Washington to prevent sensitive military technology from leaking, but critics say it is making Japan buy equipment at the asking price which is extremely expensive. To secure enough SDF personnel as Japan's overall population ages and birthrates decline, the government says in the guidelines it plans to raise the retirement age of members and more actively recruit women.